KUALA LUMPUR: 1Malaysia Development Bhd (1MDB), the agency tasked to develop most of the government land, is identifying partners to draw up a masterplan for its Bandar Malaysia and Kuala Lumpur International Financial District (KLIFD) projects in the city. Among the international architects and designers being considered are Forsters & Partners as well Skidmore, Owings & Merrill LLP (SOM). The masterplan for both projects will be based on the same approach especially in terms of financial modelling, parcelling and tenders. Complementing each other will be the Islamic financial hub on 80 acres at the Dataran Imbi area and the mixed development on 460 acres at the Sg Besi old airport. “We target to unroll the vision and plan for the two projects in a year’s time,’’ he said, adding that momentum of work was essential to keep the young team on their toes while the public would also want to see some progress. Its potential partners, which may also bring in equity, include the Qatar Investment Authority (which has proposed to invest US$5bil in Malaysia) as well as parties from Abu Dhabi and China. Reports have indicated that the Abu Dhabi Future Energy Co (Masdar), which is a wholly-owned subsidiary of Abu Dhabi’s Mubadala Development Co, may be an interested party while 1MDB is in contact with the CITIC group of China. Among 1MDB’s board of advisors are Khaldoon Khalifa Al Mubarak, chairman of Abu Dhabi Executive Affairs Authority, CEO & MD of the Mubadala Development Co and Chang Zhenming, vice-chairman and president of the CITIC group. “We are in a fortunate position where we have interesting projects for foreigners and locals to take part in,’’ he said. The two developments at Imbi and Sg Besi will be connected via public transportation and feature a balanced approach where the gross development value will make commercial sense as well as ensure future sustainability. “It should be attractive to investors and tenants while at the same time, offer affordable housing especially to the younger people as in the way that Singapore has provided apartments that are accessible via public transportation. “Young people should be attracted to live in the city, infuse it with vibrancy and revive it to the next level,’’ he said. The KLIFD that will promote Islamic finance, will likely comprise a cluster of financial services related groups such as banks, legal firms, IT consultancies and others. The idea is for a hub where there are world-class facilities for working, dining and relaxing in a safe environment. Among other things, removal of redtape, provision of incentives and tax breaks, salary structures and types of businesses are being looked into, with a view to attracting talent back into the country. For 1MDB, the plan for Bandar Malaysia represents a new opportunity for a green and energy efficient development. “A big park of 80 acres, in the likes of Hyde Park in London, will differentiate this part of Kuala Lumpur from some neighbouring cities. It will make people feel they can breathe and that they are part of the society that cares about nature,’’ he said. There may be a place for big events and people’s forums, a university for the leading edge in technology in partnership with world-class firms, a library where there are also shows, book signing and activities for the young and old. “Besides the construction costs, we have to factor in the cost for long-term sustainable maintenance,’’ he said. MANAGERS of real estate investment trusts (REITs) are hoping for a reduction in withholding tax for REIT investors in next year's budget, to spur the industry growth and make it more competitive. To keep the industry in line with international practice, REIT managers are also proposing for relaxation on fund-raising exercises. These issues will be brought up by the Malaysian REIT Managers Association (MRMA) during the pre-budget dialogue. 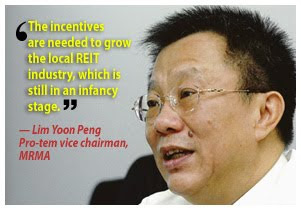 MRMA pro-tem vice-chairman Lim Yoon Peng said the incentives are needed to grow the local REIT industry, which is still in an infancy stage. "REITs are a new asset class, which are fairly attractive, defensive, low beta, not volatile, pay regular dividend and tax-efficient. "But not everybody in the country is familiar with REIT, especially among retail investors," he said in an interview with Business Times in Kuala Lumpur recently. MRMA, which was formed last year, comprises the managers of 11 Malaysian REITs. They are AmFirst REIT, AmanahRaya REIT, Atrium REIT, Axis-REIT, Al-Hadharah Boustead REIT, Al-Aqar KPJ REIT, Hektar REIT, UOA REIT, Quill Capita Trust, Tower REIT and Starhill REIT. The REITs are all listed under the new Securities Commission (SC) Guidelines for the Real Estate Investment Trusts introduced in January 2005. 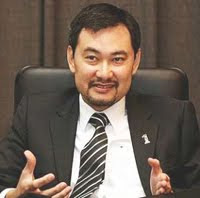 Lim, who is also chief executive officer of Am ARA REIT Managers Sdn Bhd, the manager of AmFIRST REIT, said the proposed reduction in the withholding tax for REIT investors and relaxation of fund-raising exercises requires amendments to the SC guidelines. Currently, the SC guidelines state that REITs can only place out new units of up to 20 per cent and it can be done only once in every 12 months. Lim said REITs need to raise funds more frequently in order to acquire more properties to expand the trust. He also said that in Singapore, individuals do not pay withholding tax on REIT investments. Both local and foreign retail investors in Malaysia now have to pay a 10 per cent withholding tax. Lim said as REITs pay off almost 100 per cent of their income, they are an attractive asset investment class. He said REITs are not as volatile as equities. They also have low correlation, where, for instance during the recent euro crisis, some shares dropped by 5 to 8 per cent but REIT shares did not fall that low. "As REITs pay regular and stable income, they are a good investment portfolio for insurance and pension funds. "Retail investors' awareness on REITs is very low and REIT managers have been organising roadshows to familiarise them with the benefits of investing in REITs," he said. Lim said generally, promoters and sponsors take up between 40 and 50 per cent of a REIT's initial fund size, and allocate a further 40 per cent to institutional investors. This leaves only a tiny portion for retail investors. The current market capitalisation of REITs in Malaysia is some RM6 billion and, together with Sunway REIT and CapitaMalls Trust coming onstream by the middle of this month, the total market capitalisation will exceed the RM10 billion mark. KUALA LUMPUR: Real estate investment trusts (REITs) offer many advantages to investors who are keen to invest in the property market. Axis REIT Managers Bhd chief executive officer Stewart LaBrooy said what was important now to REIT players was to educate them on the benefits on investing in REITs. “We need to educate them as most of them are not really aware of the advantages, such as having a higher yield compared with some other investments,” he said yesterday at the Investor Insights into Malaysian REITs in 2010. As a result of the lack of awareness on REITs, he said, the participation from Malaysians in REITs was still small compared with other countries. “We have 13 REITs now listed on Bursa Malaysia that cover all types of industries. With a high dividend yield of about 7% annually, low entry cost and support with higher corporate governance, REITs should be the choice of investment,” he said, adding that the size of assets of Malaysian REITs was now about RM16bil. In REITs, a pool of money from investors is invested in properties such as office buildings or shopping malls and the investment is managed by REIT managers. LaBrooy said another advantage of investing in REITs was the tax efficiency where investors were taxed only once. “Apart from that, it is easy to invest in REITs as you can buy it today and sell the unit tomorrow, similar to equity stocks. Plus, REITs are a hedge against inflation,” he said, adding that they were low risks and a passive type of investment. He said the way REITs did its business was to make sure about 90% to 100% of its retained earnings before tax were given back to investors. “Last year, despite facing a global economic crisis, Malaysian REITs were still giving back about 70% to 80% of its retain earnings to investors,” he said. Meanwhile, touching on the outlook of residential and office market in Malaysia, CB Richard Ellis (M) Sdn Bhd executive chairman Christopher Boyd said overall, both markets were still stable. “For the residential market, we are still in the safe net as in Malaysia, developers are still using the method of sell-first-before-build. If you build first then sell like what is done by some other countries, then you will risk yourself of not getting buyers if suddenly problems arise, such as the economic downturn, ” he said. HwangDBS has recommended a "hold" stock rating for KLCC Property with a target price of RM3.70. The securities firm noted that KLCC Property's 2010 earnings (ex-fair value gains) grew by 4 per cent to RM233 million. Revenue rose 2 per cent, driven by office and retail segments’ +3 per cent and +8 per cent respectively, which helped to mitigate the 13 per cent dip in hotel operations. While retail turnover at Suria has returned to pre-crisis’ RM2 billion and footfalls remained a high RM42 million, Mandarin Oriental saw lower occupancy rate of 55 per cent (FY09: 65 per cent) albeit stable ARR of RM636. KLCCP has no intention to cut ARR but rather focus on product differentiation, value add promotions and cost control. Long term locked-in rental income from blue-chip tenants should continue to sustain future earnings.